Getting sick during your pregnancy can lead to more significant consequences than a few days laid up with old movies and chicken soup. While a garden-variety cold is unlikely to harm your developing baby, some infections can lead to birth defects and lasting health issues. When it seems like everyone is getting sick, how do you keep yourself safe from infection? Unless your doctor has advised against it, go ahead and get immunized against the flu. The shot is safe for pregnant people, and is recommended by the CDC. Just say no to the nasal spray version, which uses a weakened but still live virus. Some major supermarket pharmacies and drugstores stock flu shots and accept walk-in appointments, so you can fit the shot into your schedule. Most forms of health insurance also cover the flu shot. Don’t hug, kiss, or shake hands with people who are sick or are “just getting over” an illness. Your immune system is weaker than usual so your body doesn’t attack your baby’s unfamiliar presence. Taking extra precautions to avoid infection is smart. Carry hand sanitizer in your purse so you can clean up on the go. Pro tip: Pick up a nice hand cream. Frequent washing plus dry, chilly air can lead to cracked or flaky skin. Avoid traveling to areas with Zika, if at all possible. Mexico, Caribbean countries, much of South America, some South Asian countries, and many African countries near the Equator have been flagged by the CDC as areas with Zika risk. If you have to travel to an area with high Zika risk, talk to your medical provider beforehand about the best ways to reduce infection risk. Be diligent about preventing mosquito bites. Zika can be transmitted sexually as well, so if your partner spent time in areas with higher Zika risk, your medical provider might recommend that you use condoms during your pregnancy to minimize infection risk. 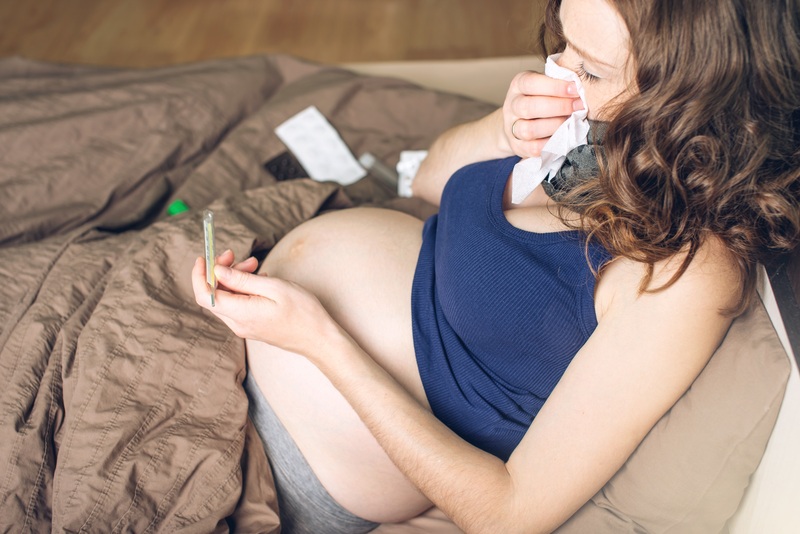 Again, not every sniffle is a sign of a illness that could harm your baby. You don’t need to feel alarmed anytime you don’t feel well. But keep an eye on illnesses, and don’t be afraid to call in if you’re not feeling better in a couple days. Go over your medical history with your doctor. If you’re missing certain vaccinations, your doctor may recommend getting them now. Call your doctor over a yeast infection, especially one that doesn’t respond to over-the-counter treatment. Bacterial vaginosis and UTIs could require further treatment. You can’t live in a bubble during pregnancy, but healthy practices can reduce your risk of getting sick. Here’s hoping you won’t need a single sick day. Aside From Folic Acid, Which Vitamins & Minerals Are Recommended When Planning A Pregnancy?